Cordell Bank National Marine Sanctuary has diverse and abundant marine mammal species including 13 species of cetaceans (whales, dolphins and porpoises) and five species of pinnipeds (seals and sea lions). Pacific white-sided dolphins are the most frequently sighted marine mammal in the sanctuary. Other common cetaceans observed include Dall's porpoises and northern right-whale dolphins. Endangered humpback and blue whales are regularly seen in the summer and fall when they visit the sanctuary to feed. Sanctuary waters are used by a mix of permanent and seasonal animals, including mammals that use these waters for shorter periods - either as a feeding destination area or in transit during long-distance migratory journeys. California's central coast is located on a migration pathway between northern feeding grounds and temperate and tropical breeding areas for many marine mammal species. For those marine mammals that use the sanctuary as their feeding grounds, the great amount of food available for them is caused by annual spring/summer upwelling. 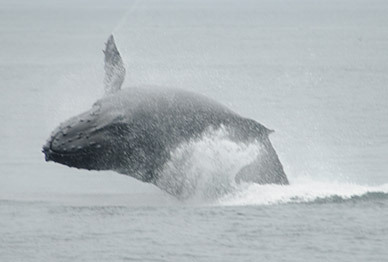 Baleen whales, such as humpback and minke whales, feed mainly on krill and small schooling fishes, which are abundant within Cordell Bank's upwelling-driven ecosystem. In contrast, toothed whales and pinnipeds feed mainly on fishes and squid found in the sanctuary. For more information on marine mammals within Cordell Bank Sanctuary and the research being conducted on this topic, please visit the Sanctuary Integrated Monitoring Network (SIMoN).